"Wow, mommy! Look at the bear! It's dancing!" Bears: Bears in the circus may look happy, walking on hind legs, dancing, and riding around on a bicycle. But how do they train them? And how do they live? To get bears to keep up their front legs to walk, the trainers usually burn the footpads of the bear's feet(an extremely sensitive part of the body) until it hurts too much to walk normally. The bears are often forced to wear muzzels during performances to keep them subdued. This interferes with breathing and vision. Elephants: Some of the most mistreated circus animals. They are usually torn away from the wild, away from their families, and chained down while the trainer beats them with metal rods, baseball bats, metal pipes, and axe handles, to break their spirits so they fear to disobey the humans. Circuses may visit 150 towns a year, and a clean water supply is not readily available in every location. As a result, drinking water is limited, and cleaning the animals and their cages may take low priority, causing a real hardship for animals like elephants, who normally bathe frequently. Food is often equally limited. Climatically, the circus environment is quite different from the animals' natural habitats. The hot summer months can be especially hard on animals like bears, while others, like lions, suffer most from the cold. George Lewis, in Elephant Tramp , tells of traveling with Ringling Bros. in the winter: "When we went to unload the elephants, we found the long trip had been too much for one of the oldest, Queen. She was lying dead inside a car." Veterinarians qualified to treat exotic animals aren't always present or available, and animals have suffered and died due to a lack of proper medical attention. During the winter off-season, animals used in circuses may be kept in traveling crates or in barn stalls; some are even kept in trucks. Few circuses have the funds or the desire to put much money into comfortable winter shelters, since off-season housing is used for only a few months per year. Such unrelieved physical confinement has very harmful physical and psychological effects on animals: A study conducted by the Born Free Foundation found that confined elephants spend 22% of their time in abnormal actions, such as repeated head-bobbing or swaying, and confined bears spend about 30% of their time pacing. Some animals are drugged to make them "manageable," and some have their teeth removed. One former Ringling Bros. employee told the Elephant Alliance how the circus treated one animal: "She was a sweet little innocent brown bear who never hurt anyone . . . but sometimes she had trouble balancing on the high wire. She was then beaten with long metal rods until she was screaming and bloody. She became so neurotic that she would beat her head against her small cage. She finally died." The tricks that animals are forced to perform--bears balancing on balls, apes riding motorcycles, elephants standing on two legs--are physically uncomfortable and behaviorally unnatural. The whips, tight collars, muzzles, electric prods, bullhooks, and other tools used during circus acts are reminders that the animals are being forced to perform. 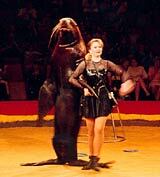 These superficial "performances" teach audiences nothing about how animals behave under natural circumstances. Animals in circuses are often portrayed as either ferocious or stupid compared to their "brave" or "commanding" human counterparts; their true nature is never seen. When animals "attack" audience members, it is simply fighting back against the pain. Animals are most often shot to death when they attack the audience, simply for standing up for themselves. Please, don't support this cruelty, and don't go to the circus.